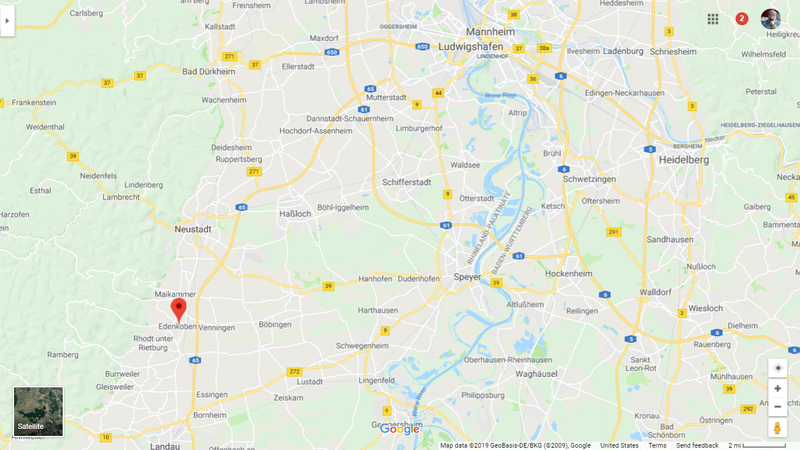 Johann Jacob Wilhelm (1700-1773) is #410 on my Ahnentafel List, my 6th great-grandfather, who married #411 Anna Catharina Unruh (1709-after 1773) in about 1727 in Rheinland-Pfalz, Germany. Johann Jacob Wilhelm was born about 1700, probably in Rheinland-Pfalz in what is now Germany[1,4]. His parents are not known. He was known as Jacob Wilhelm in all records found to date. Some of the information below was obtained from a book or manuscript by John H. Grimes titled "The Wilhelm Family of Northwestern Berks," which cites "Hochstadt Origins of Some Early Settlers at Host Church" by Annette K Burgert. I have not been able to find these works to date. Perhaps they are held in a local or state repository. In about 1727, Jacob Wilhelm married Anna Catherina Unruh, probably in Edenkoben, Rhineland-Pfalz. She was born and baptized there in 1709, the daughter of Hans Georg and Anna Apollonia (Schweitzer) Unruh. On 23 September 1734, all male persons above the age of sixteen had to appear in the Court House, in order to swear allegiance to the rules of the country, to wit: The King of Great Britain and His successors to the Crown of England. Imprimis, It is my will, and I do order, that all my just debts and funeral expenses be paid off and discharged by my executors herein after named, as soon as conveniently may be done after my God grant happy decease. Item, I give, devise, and bequeath unto my present loving wife Catharine the free use and privilege of living in my present dwelling house, situate in Prince street, in the Borough of Lancaster, and lot thereto belonging, during her life, if she stays my widow; and I will and order, that unto her my said wife Catharine, as long as she liveth and stays my widow, by my two sons Philip Jacob & Adam, and their heirs, yearly and every year, shall be given and delivered sixteen bushels of wheat and eight bushels of rye, vizt. each eight bushels of wheat and four bushels of rye; also, each of my said sons shall give unto her one bushel of salt, and each one barrel of cyder, yearly, and apples as much as she shall have need of, to her own use; and to give and haul to her dwelling sufficient firewood; each one wagon load of good hay; and each one hundred pounds of pork to be given to her. I also give and bequeath unto my said loving wife, Catharine, the full sum of one hundred pounds lawful money of Pennsylvania, to be paid unto her by my hereafter named executors out of my estate. Item, I likewise give and bequeath unto my said wife Catharine, all my household furniture, bedds and whatsoever kind it may be, during her life. But after the God grant happy departure of my said wife, I give and bequeath the aforesaid house & lot, as also household furniture left by the decease of my said wife, unto my five children, vizt. Jacob, Philip Jacob, Adam, Maria Catharine, wife of Henry Zank, and Maria Barbara, wife of Philip Jacob King, to be [after the deduction of fifteen pounds lawful money aforesaid, which said sum of fifteen pounds I out of the aforesaid premises give and bequeath unto my said sons Philip Jacob, his heirs and assigns forever, to have beforehand over and above his equaly share; and ten pounds lawful money as aforesaid, which I also out of the aforesaid premises, give and bequeath unto my said son Adam his heirs and assigns forever to have beforehand over and above his equaly share] equally divided amongst them. Item, I give and bequeath unto the poor and needy of the congregation of the German Reformed church, in the Borough of Lancaster, the full sum of five pounds lawful money aforesaid, to be distributed to them by my hereafter named executors out of my estate and that to such which shall bring an order from the minister of said congregation being at that time, that they have need of it. Item, I give and bequeath unto Jaco Zank, son of Henry Zank, the full sum of ten pounds lawful money aforesaid, out of my estate, to be directly after my decease laid out upon interest, to and for the use of said Jacob and care be taken thereof by my hereafter named executors or either of them, and to be paid by my executors, or either of them, or caused to be paid unto him the said Jacob, at the time of his age of twenty one years, or day of marriage which shall happen first, together with the interest than due thereon. Item, I give and bequeath unto my son Jacob, being the eldest, the full sum of ten pounds lawful money aforesaid, the same to have beforehand, over and above his equal share out of my estate, to be paid to him my said son Jacob, his heirs and assigns, by my hereafter named executors. Item, I also give and bequeath unto my said son Jacob, the elder, one hundred and sixty acres of land, situate in Tulpehoken township, in the county of Berks and Province aforesaid, together with all the improvements, rights, titles, deeds, writings, buildings, interests, properties, claims, & demands of, in, and to the same belonging or in any wise appertaining the same, To have and to hold unto him my said son Jacob, his heirs and assigns and to his and their only proper use, benefit, and behoof forever, which said tract of land and premises, I myself unto my said son Jacob, for three hundred pounds lawful money aforesaid. Item, I give, devise, and bequeath unto my son Philip Jacob, that moiety or one half of the plantation where the new stone house is build on, situate in Manheim township in the county of Lancaster, being one hundred and fifty acres of land, together with all & singular the improvements, hereditaments, deeds, rights, titles, writings, buildings, interests, properties, claim & demand, of, in and to the same belonging, or in anywise appertaining, and together with the right and privilege to the water on the other moiety of my said plantation, which I shall herein after bequeath to my son Adam; and to have the said water on the south side five days in the week, vizt. from Monday till Friday included; and on the north side two days weekly, vizt, Mondays & Tuesdays to water to water his meadows; and my son Adam, his heirs and assigns, shall for that purpose keep open and make or cause to be made and kept open the water ditch on his land till to the fence or line of my said son Philip Jacob's land; but in case my son Adam should not keep open, and make or cause to be made and kept open said ditch eighteen inches broad nor could by law be forced thereto, than I give and bequeath the right and privilege to my said son Philip Jacob, his heirs and assigns, to go on Adam's moiety and make the said ditch of eighteen inches broad or cause it to be made, to lead the water on his moiety as aforesaid, without hindrance or molestation. To have and to hold the same to him, my said son Philip Jacob, his heirs and assigns, and to his and their only proper use, benefit & behoof forever. Which said one hundred and fifty acres of land or messuage I myself value unto him my said son Philip Jacob, for six hundred pounds lawful money aforesaid. Item, I give and bequeath unto my son Adam, that moiety or one half part of my said plantation whereon the old stone house stands, situate in Manheim township as aforesaid, it being also one hundred and fifty acres of land, together with all and singular the building, improvements, hereditaments, rights, titles, deeds, claim, & demand of the same belonging or in anywise appertaining, together with the full privilege of using the present land to pass and repass to the road without any molestation or hindrance of him by my said son Philip Jacob, his heirs and assigns. To have and to hold the same unto my said son Adam, his heirs & assigns, and to his and their only proper use, benefit, and behoof forever. Which said one hundred and fifty acres of land or messuage I myself value unto him for six hundred pounds lawful money aforesaid. Item, I will, order, and direct, that all my aforenamed five children shall receive equal shares and portions of both my real & personal estates, except that what is bequeath beforehand as aforesaid. I therefore will and order that my said sons Philip Jacob, and Adam, each of them, shall pay yearly after my decease to the rest of my said five children, which are to short yet twenty five pounds, being fifty pounds jointly lawful money aforesaid, and that as long till they are equal in their shares & portions. But after the death of my said two daughters Maria Catherine and Maria Barbara, I give and bequeath the share or shares due to them to their left issues or children, equally divided amongst them. To have and to hold the same to them their heirs and assigns forever. And lastly, I nominate and appoint my said son Philip Jacob & my said son Adam, exors of this my last will and testament. Hereby declaring this and no other to be and contain my last will and testament. Dieterich Heise & John Jacob Loeser, the two witnesses sworn and the two exors sworn, before me the 16th of October 1773. Edwd Shippen, D. Rr. Johann Jacob Wilhelm was buried in the First Reformed Church Memorial Garden in Lancaster on 12 October 1773. Based on his age 73 at the time of his death, he was born circa 1700. 1. Find A Grave, indexed database and digital image, (http://www.findagrave.com), First Reformed Church Memorial Garden, Lancaster, Penn., Johann Jacob Wilhelm memorial #164620433. 2. I. Daniel Rupp, A Collection of Upwards of Thirty Thousand Names of German, Swiss, Dutch, French and other Immigrants in Pennsylvania From 1727 to 1776 (Philadelphia, Penn. : IG. Kohler, 1876), pages 94-97. 4. John H. Grimes, "The Wilhelm Family of Northwestern Berks," manuscript, unknown publisher and repository; Jacob Wilhelm and Anna Catharina Unruh marriage entry.